In their first years, ART+COM’s research focused on virtual medicine. 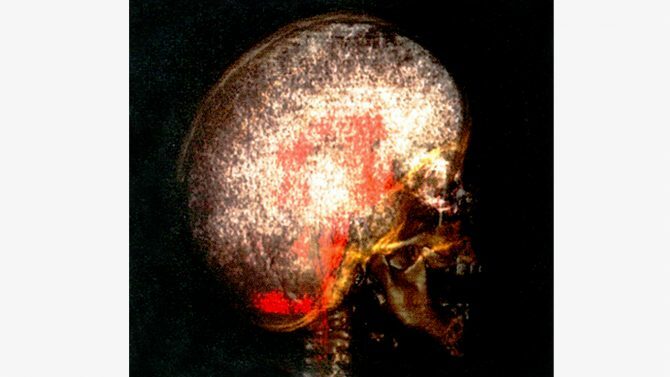 A number of medicine-related research projects explored the 3D visualization and simulation of CT and MRT data as well as of spaces and processes. 1988 marked the starting point of “Vidimed”, short for “visualization of digital medical data”, a joint research program with the Rudolf Virchow University Clinic in Berlin. ART+COM’s 3-D visualizations of CT and MRT data supported medical diagnostics and surgical planning. The general vision of this research project was to simulate complex surgical interventions, in particular to explore new methods and access points for endoscopic surgery in order to optimize surgical planning and preparation. 3D real-time visualizations were supposed to enable telematic medicine, including telediagnosis and remote-controlled surgery as well as to be used in surgical training. The first research project focused on the early recognition of herniated vertebral discs. The second explored the telediognosis, planning and realisation of endoscopic brain surgery. ART+COM’s endevours went into the visualization of liquor in the ventricular system. In a further Vidimed project, ART+COM dealt with the 3D simulation of faces, their physical structure and physiognomy, central for the planning of surgeries on patients suffering from craniofacial abnormalities. An entire set of software tools was developed that enabled semi-automated segmentation of the various parts, such as muscles, bones and humour. What followed was a research project that visualized the blood flow in the arterial system and simulated it for real-time VR in order to prevent thrombosis. In 1993, the University Clinic of Mainz and ART+COM explored the vision of a high-tech operation theatre where many of the results of the Vidimed research played an integral role. This research project was named OP 2015 and resulted in a concept and 3-D visualisation of an operation theatre built for stereotactical brain surgery, other endoscopic surgeries and radiotherapy. One of its features was a mechanically controlled surgical equipment which was supposed to relieve manual surgery. The surgeon was to watch the 3D simulations and real-time visualizations in a head-mounted display during surgery. Whilst the limited computer power back in the days had an influence on the quality of 3D visualisations, most of the envisioned technologies have become part of today’s reality. ART+COM‘s unique interdisciplinarity served as an ideal basis for such visionary research projects, whose crucial significance has been proven true during the course of time.